Since 2000, we have been known as Gingko Audio. Recently, a customer who is also a botanist pointed out to us that our spelling is incorrect even though it is sometimes accepted as a variation of the word. The correct spelling is ginkgo, as in “ginkgo biloba”. That led us to acquire the www.ginkgoaudio.com domain name, while retaining www.gingkoaudio.com and the totally incorrect but often used www.ginkoaudio.com domain. So be assured that whichever name you want to use, we are here to answer the call. Our mission at Gingko Audio is to provide effective and aesthetically elegant solutions at a fair price. We specialize in products custom-designed for high-end audio/video applications. Our product line consists of the patented Cloud vibration control platforms featuring our Platformula™ technology, ClaraVu™ dust covers, and the patent-pending ClaraVu™ speakers. 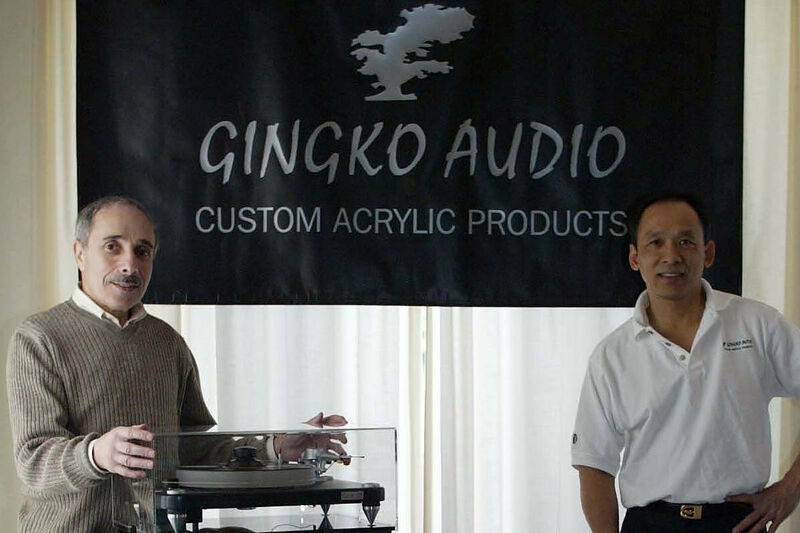 Visit our Dealers page for links to the Gingko Audio dealer in your area. Gingko Audio is also the worldwide exclusive marketer of Danacable™ products. Vinh Vu spent 23 years at Bell Labs and Lucent Technologies as a system engineer, product manager, and marketing manager for telecom switching systems, optical transmission systems, intelligent networks, and video products. He holds two patents in design of telecom systems and another patent for the Cloud Vibration Control System. Vinh has been involved in high-end audio/video since 1990. He founded Gingko Audio in 2000, specializing in making custom acrylic dust covers for high-end turntables and soon extended the product line to award-winning vibration control platforms and speakers. Vinh has a Bachelor of Science in Industrial and Systems Engineering from Ohio University and a Master of Engineering in Industrial and Systems Engineering from Virginia Tech. Norm Ginsburg, Gingko Audio’s Marketing Director, has been involved in audio for more years than he cares to remember. After years of tinkering with home-brew electronics as a teenager, he built his first high-end system, a Dynakit amp, pre-amp and tuner, in the 60s. A graduate electrical engineer, he earned additional masters degrees from the University of Illinois and the University of Southern California while pursuing a career in the Army as a communications officer. Following military service, he worked for AT&T and Lucent Technologies in marketing and product management. Upon his retirement from Lucent Technologies, he and Vinh began exploring general ways to improve audio system sound quality.